This study was commissioned by the Education Sector Analytical and Capacity Development Partnership (ACDP), an initiative supported by the Government of Indonesia, the Australian Government, the European Union and the Asian Development Bank. The institutions responsible for implementation of the study were the Australian Council for Educational Research (ACER) and SMERU Research Institute supported by Cambridge Education. 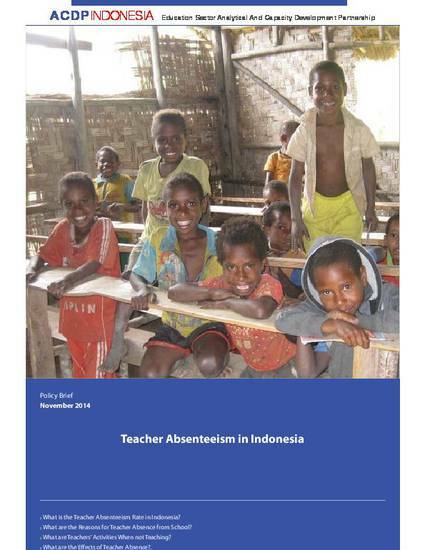 This study of teacher absenteeism in Indonesia is one of the most comprehensive and large-scale studies of teacher absenteeism undertaken anywhere in the world. Specially trained teams made two unannounced visits to each of the sampled schools during their regular teaching and learning time. The teams collected information on teacher absence, observed classes, conducted interviews with principals and teachers, and administered short tests to samples of students. Visit 1 was in late 2013 and Visit 2 in early 2014. Interviews were also held with district-level officials. The research examined not only teachers’ absence from school, but also any absence from class of teachers who, although present at school, were not teaching as scheduled. The final sample comprised 880 primary and junior secondary schools across six regions – Sumatra, Java, Bali and Nusa Tenggara, Sulawesi, Kalimantan, and Papua and Maluku – and included 119 of the 147 primary schools involved in a similar study conducted in 2003. In all, data were collected from over 8,300 teachers and 8,200 students.